The sky is no longer the limit. The SwagDrone 210-UP FPV quadcopter is designed to give you an aerodynamic edge whenever you race. 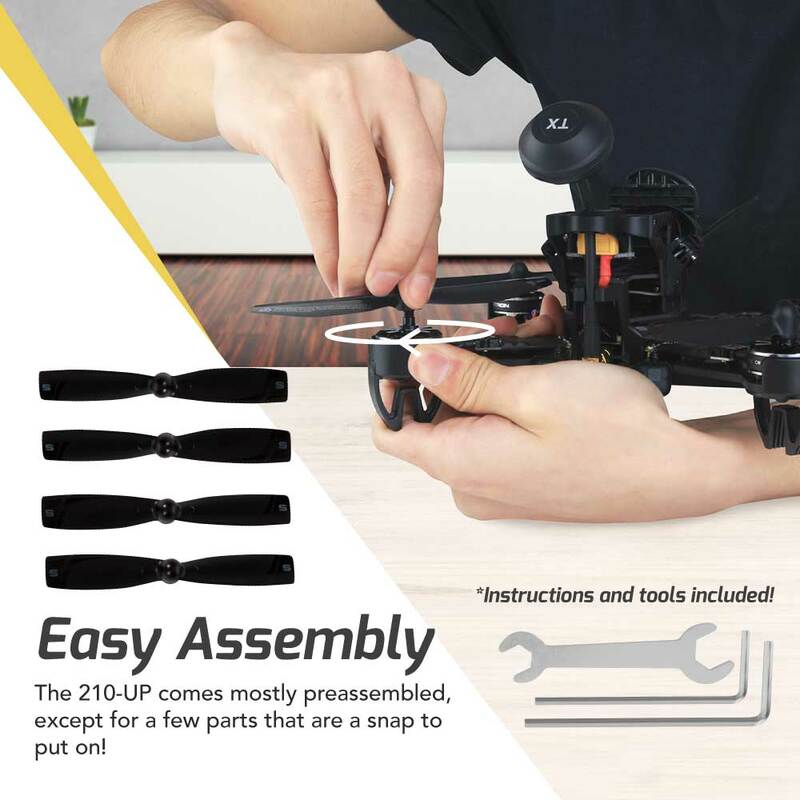 Weighing in at less than a pound, the 210-UP is truly streamlined for optimal performance and easily assembles in minutes! The FPV racing drone has 3 modes for pilots of all skill levels, including: Primary, Mid, and High Level. 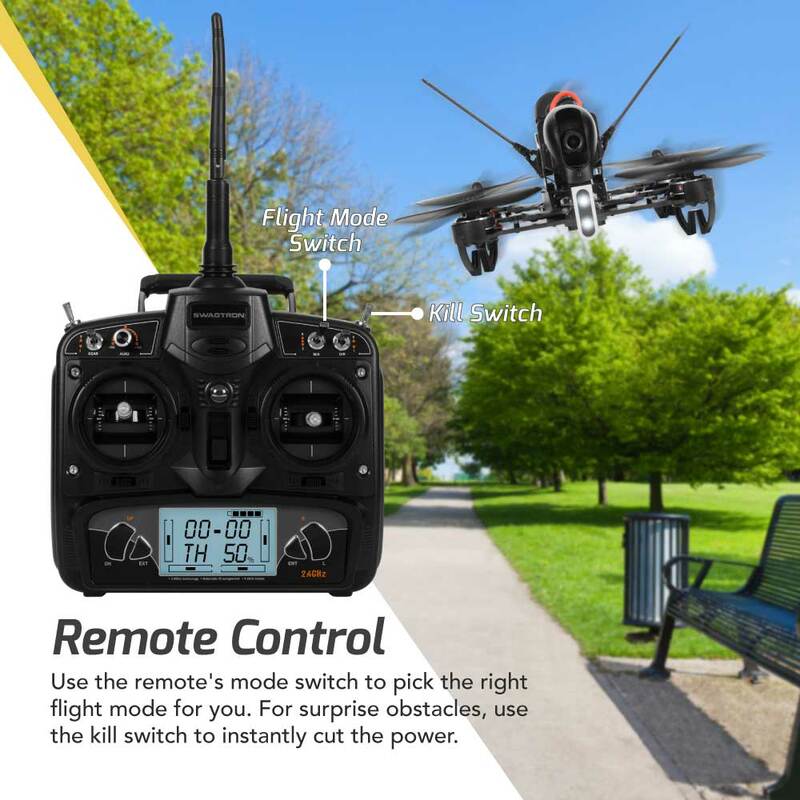 Using the responsive remote control for ultimate maneuverability, the drone’s built-in 3-axis gyro and F3 flight system help kick things into high gear. 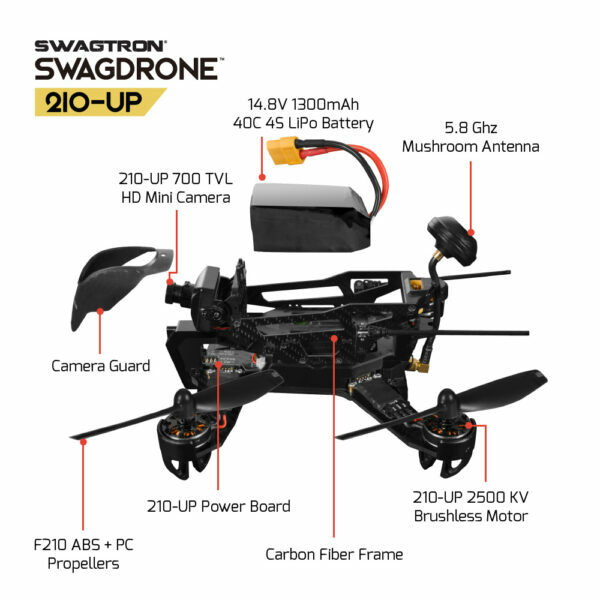 With a supercharged Li-PO battery for extended flight time, execute acrobatic loops for as long as you want. The flexible 5.8G mushroom antenna and dual receiver antennas will let you issue commands from as far as 800 meters total! 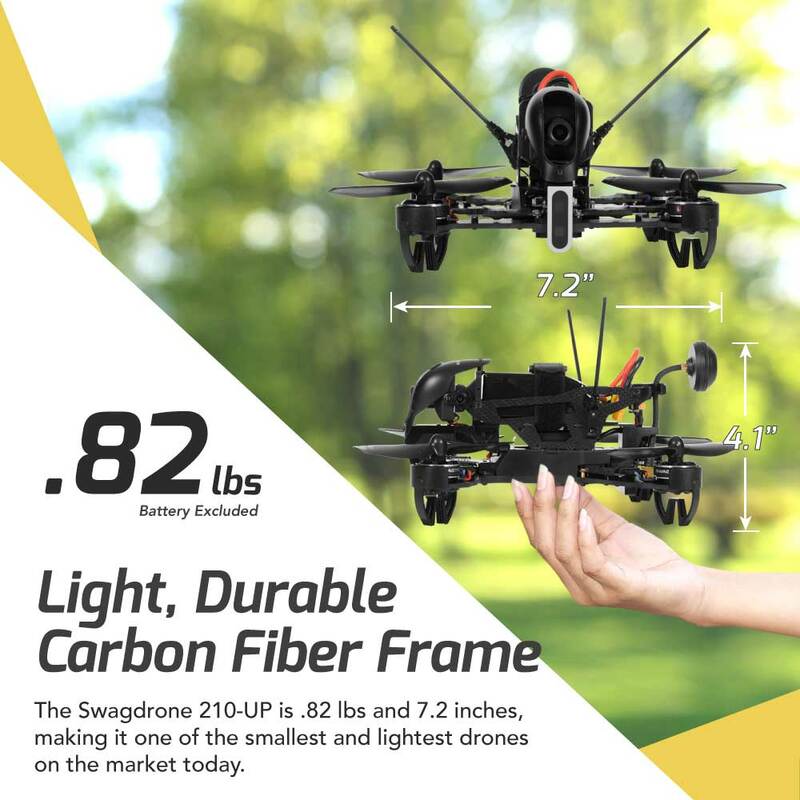 For experienced pilots, this racing quadcopter can be customized to your specifications via the Cleanflight software.The 210-UP features a lightweight, ultra-durable carbon fiber frame designed to be damage resistant. Take flight knowing your drone is in good hands with an automated failsafe switch that activates the moment your drone registers as out of range. 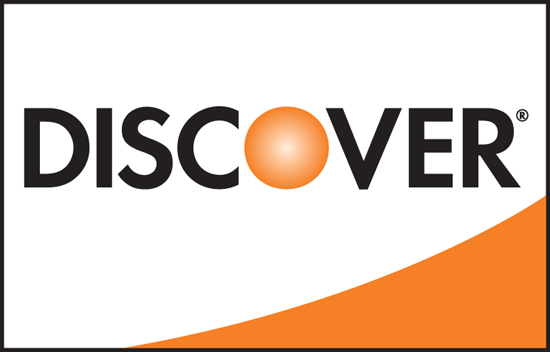 Meanwhile, dynamic locator alarm helps you find your drone and get back to flying! And for emergencies, just flip the kill switch to instantly turn off the drone. Repairing the 210-UP is hassle-free thanks to its straightforward, modular design. 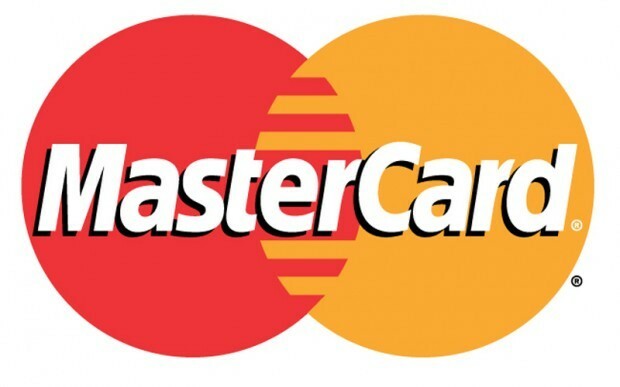 Simply remove the damaged parts, pop in the fresh ones, and you’re done! 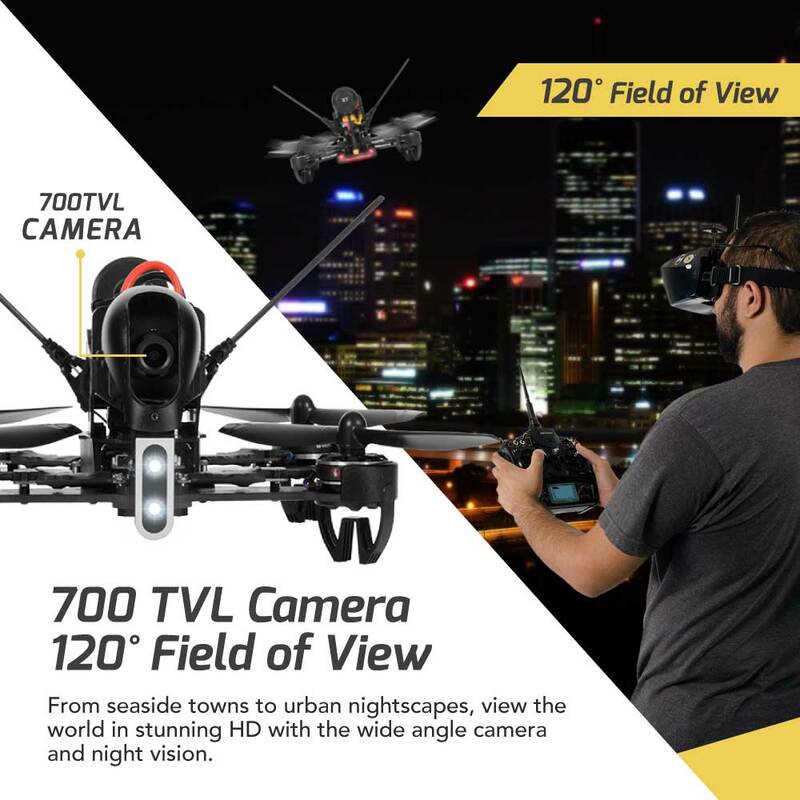 Whether you’re looking to record beautiful arial scenes on your camera, explore your city like never before, or gain a competitive edge in high-speed FPV drone racing, the 210-UP is equipped with something for every pilot. It even has LED headlights and is outfitted with a night vision camera for optimal viewing no matter what time of day. With a 120° field of view and 700TVL camera, the 210-UP delivers a sharper resolution than competing drones. 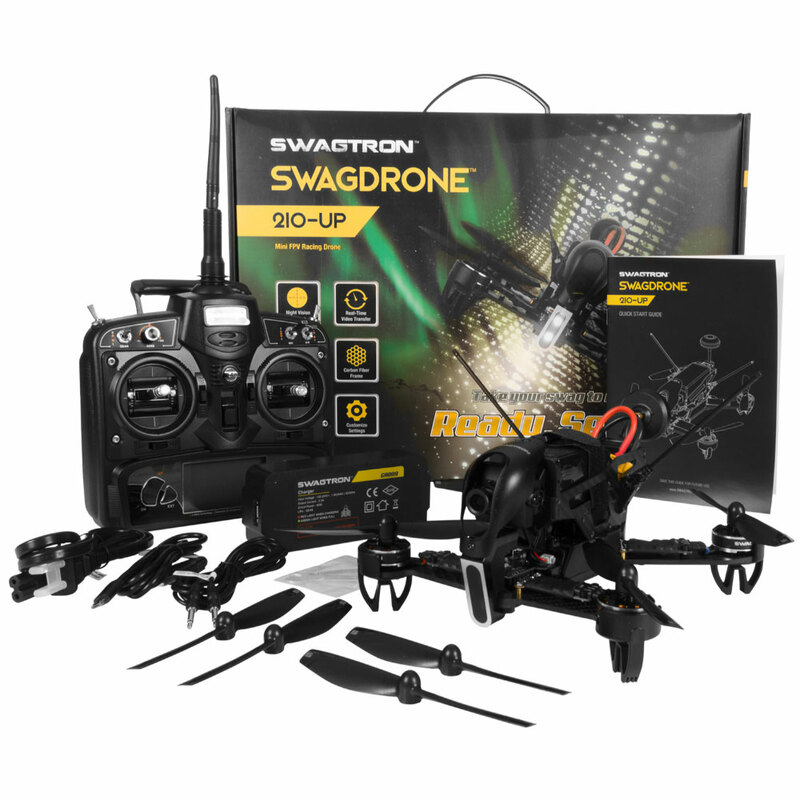 SwagDrone connects with the 4-UP (or other compatible smart devices) for advanced HD 5.8GHz real-time video transfer. Sync your the VR racing drone with the 4-UP (or other smart devices) and select any of the 8 available channels. And when you’re done with your flightpath, the SwagDrone comes built with a motor lock function for safe handling and storage.